Continue your philanthropy beyond your lifetime by crafting a legacy of giving that reflects your charitable values. A giving legacy, laid out in a succession plan, is an effective way to ensure the assets remaining in your philanthropic account continue to fulfill your charitable mission. Choose from a variety of options to mix, match, and build a plan that meets your philanthropic needs. 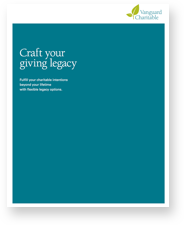 Succession plans that support your charitable legacy are set up to be flexible and can be changed or amended at any time if needed. or unable to manage account processes. Vanguard Charitable remains the sole owner of the assets within the account and has full discretion to invest and grant the assets. If you do not choose a succession plan, your account's assets will automatically transfer to The Philanthropic Impact Fund. This fund, managed by Vanguard Charitable's board of trustees, issues grants primarily to nonprofits whose work seeks to improve philanthropy by developing and delivering resources to help donors make effective giving decisions and help charitable organizations operate efficiently. your lifetime with flexible legacy options.